On a cold grey day in February. – Dirty wet dog , boats and sailing. On a cold grey day in February. There ! how was that for an opener ? and just when i am writing a blog with a single letter title : how now our minimalism ?. The finisher to the starter is that on a cold grey day in February i found a bloke sitting on a trestle and painting his boat’s topsides….gloss too which somewhat surprised me. Today i had to do a lot of running around, in fact my route was almost a road circuit of the Tamar starting and finishing way upstream at the single track ‘new bridge’ at Gunnislake : weird place, weird people and definitely with its own highway code. The essentials are that i had to go shopping for some basics : meths for my stove, petrol for the motor, a new ‘BOSS’ , some bits and pieces for projects and this years tidal almanac as i will hopefully need to know the tides beyond this one river. Along the way i made it my goal to try and drive to the oddly named wearde quay to try and get a look at a boat that is alongside there right now : i had sailed past the quay twice during my cruise and wanted to see the boat that was leaning up against the wall there. Its a difficult place to find with a steeply descending single track road at the end but i did get there, found the quay and a short section of gravel beach and then the boat i was looking for. The boat is ‘Springtide’ and really its outside of the parameters of small boats that i have decided is my main theme, i will be talking about that in greater detail later but for the here and now i also want to cover anything that i find interesting. 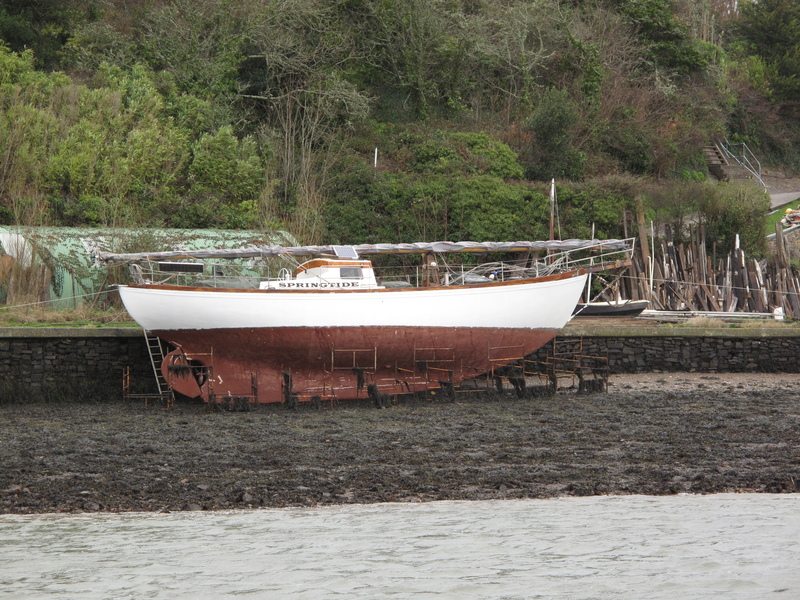 I have only seen this boat sailing twice and it was a grand sight as it was driving its way to windward in a steep hamoaze chop, wind over tide. The bloke doing the painting is her owner and i managed to get him to talk about the boat a bit while he rolled on his gloss. She is well neaped by the way and he doesn’t expect her to float off until some time next month. Springtide is a solid ‘husky’ looking boat, according to her owner she is an Alan Buchanan design that borrows heavily from the Colin Archer concept but with many of the worst features of the type taken out. Her numbers ? 50 feet on deck and 23 tons so she is s big and heavy boat by any standards. She is a powerful looking ketch under sail, her owner tells me that he is taking her up to scotland this year and keeping her there for a few years : that sounds like a good trip, he did ask me if i wanted a look-see below which i declined on the day but did say that i would like to come back and try and get better pictures on a less dull and grey day. For while we talked at the entrance to his boatshed, i told him about my boat and yes he had seen me out sailing : called me one of the early-birds so i told him about the blog and the voyage. His boatshed gives me serious mancave envy by the way , not only that but he owns the quay as well.